Toronto, Ontario. : University of Toronto Press.. Very Good+. 1969. Softcover. 8vo - 23 x 15.5 cm. ; xi - 80 pp. 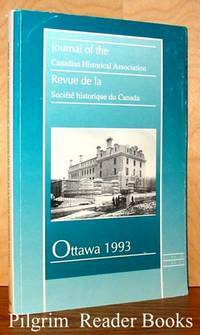 A selection of articles from the Canadian Historical Review and other volumes. 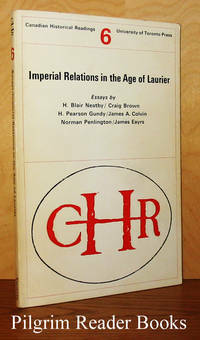 Contents: 1 - "Laurier and Imperialism" by H. Blair Neatby, 2 - "Goldwin Smith and Anti-Imperialis m" by Craig Brown, 3 - "Sir Wilfrid Laurier and Lord Minto" by H. Pearson Gundy, 4 - "Sir Wilfrid Laurier and the British Preferential Tariff System" by James A. Colvin, 5 - "General Hutton and the Problem of Military Imperialism in Canada, 1898-1900" by Norman Penlington, 6 - "The Round Table Movement in Canada, 1909-1920" by James Eayrs. Minor shelf wear to the covers and the spine is a tad darkened, otherwise clean and tight. .
Ottawa, Ontario. : Canadian Historical Association. Very Good. 1974. Soft Cover. 8vo - 23 x 15.5 cm. ; 262 pp. 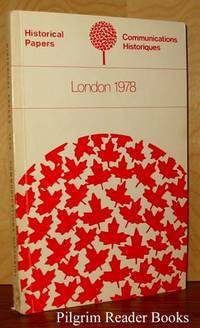 "A selection from the papers presented at the annual meeting held at Toronto in 1974". The meeting referred to is that of the Canadian Historical Society. Contents are: 1 - "Liberal Consensus or Ideological Battleground: Some Reflections of the Hartz Thesis" by S. F. Wise, 2 - "The Origins and Shaping of English Royalist Thought" by J. W. Daly, 3 - "Feminism and the Liberal Dialectic: John Stuart Mill on Women's Rights" by Jacques Kornberg, 4 - "The Winter's Tale: Contours of Pre-industrial Poverty in British America, 1815-1860" by Judith Fingard, 5 - "The Canadian Grain Trade in the 1840's: The Buchanan Case" by Douglas McCalla, 6 - "A Change in Climate: The Conquest and the Marchands of Montreal" by Jose Igartua, 7 - "Turning the Spit: Timothy Anglin and the Roasting of D'Arcy McGee" by W. M. Baker, 8 - "The Conservatism of the Saskatchewan Progressives" by L. D. Courville, 9 - "Nativism in Alberta, 1925-1930" by Howard Palmer, 10 - "Paladins of the Buergertum: Cultural Clubs and Politics in Small German Towns, 1918-1925" by Robert Hopwood, 11 - "Why the Jesuits Joined, 1540-1600" by T. V. Cohen. Very minor wear and soilng to the covers. .
Ottawa, Ontario. 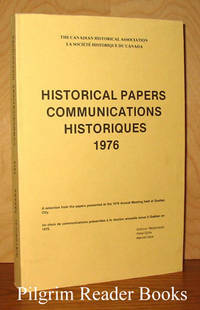 : Canadian Historical Association. Near Fine. 1983. Soft Cover. 0887980880 . 8vo - 23 x 15.5 cm. ; 309 pp. 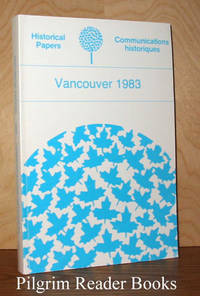 "A selection from the papers presented at the annual meeting held at Vancouver 1983". The meeting referred to is that of the Canadian Historical Society. Contents are: 1 - "Frontiere ou fragment du systeme atlantique: des idees etrangeres dans l'identite bas-canadienne au debut du XIX siecle" by Jean-Pierre Wallot, 2 - "Family Coresidence in Canada in 1871: Family Life-Cycles, Occupations and Networks of Mutual Aid" by Gordon Darroch and Michael Ornstein, 3 - "The Fear of God in Modern Political Theory" by David Wootton, 4 - "History in Schools: Reflections on Curriculum Priorities" by David Pratt, 5 - "Lord Give Us Men - Women and Social Work in English Canada, 1918 to 1953" by James Struthers, 6 - "Rural Faith and Wills as Evidence of Popular Religion in France, 1500-1650" by Alan G. Arthur, 7 - "Histoire de la famille et histoire des mentalites" by Jean-Louis Flandrin, 8 - "Pope Huxley and the Church Agnostic: The Religion of Science" by Bernard Lightman, 9 - "The waste that lies before me . . : The Public and Private Worlds of Robert Baldwin" by Michael S. Cross and Robert L. Fraser, 10 - "Les moulins a farine du Seminaire de Saint-Sulpice a Montreal (1658-1840) : essai d'analyse economique d'une prerogative de regime seigneurial" by Corinne Beutler, 11 - "The Trail of J. B. McLachlan" by David Frank, 12 - "Colliers, Collier Safety and Worplace Control: The Nova Scotian Experience, 1873-1910" by Donald MacLeod, 13 - "Canadian Railways and Manufacturers, 1850-1880" by Paul Craven and Tom Traves. Very minor wear to the tail edge of the front cover. .
Ottawa, Ontario. : Canadian Historical Association. Very Good. 1976. Soft Cover. 8vo - 23 x 15 cm. ; 276 pp. 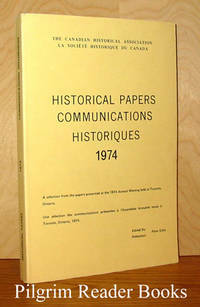 "A selection from the papers presented at the annual meeting held in Quebec City 1976". The meeting referred to is that of the Canadian Historical Society. Contents are: 1 - "Communaute Continuite: vers un nouveau passe" by Jacques Monet, 2 - "The Study of Revolutions" by George Rude, 3 - "The American View of War: The Revolutionary Perspective" by Reginald C. Stuart, 4 - "Ideology and Conquest: The Question of Proselytism and Expansion in the French Revolution, 1789-1793" by John P. McLaughlin, 5 - "A Reconsideration of the Impact of the Russion Revolution on the Revolutionar y Movement in Germany, 1917-1918" by Gerhard P. Bassler, 6 - "Livius Drusus and the Italian Question" by A. J. Marshall, 7 - "The British Abolitionists in Cuba, 1833-1845" by David R. Murray, 8 - "Feminism and Philanthropy in Victorian England: The Case of Louisa Twining" by Kathleen E. McCrone, 9 - "Women's Emancipation and the Recruitment of Women into the Canadian Labour Force in World War II" by Ruth Pierson, 10 - "Union Authority, Corporate Obstinancy, and the Grand Trunk Strike of 1910" by J. H. Tuck, 11 - "Permanently Wasteful but Immediately Profitable: Prairie Agriculture and the Great War" by John H. Thompson, 12 - "The Federal Government and Migratory Birds: The Beginning of a Protective Policy" by Janet Green, 13 - "The Collapse of the Saltfish Trade and Newfoundland's Integration into the North America Economy" by David Alexander, 14 - "Tom Naylor's a History of Canadian Business, 1867-1914: A Comment" by Douglas McCalla, 15 - "Trends in the Business History of Canada, 1867-1914" by R. T. Naylor. Very minor wear and soiling to the covers. .
Ottawa, Ontario. : Canadian Historical Association. Very Good. 1981. Soft Cover. 8vo - 23 x 15 cm. ; 237 pp. 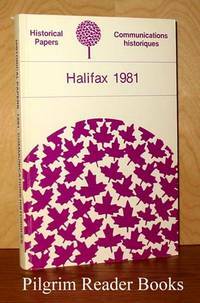 "A selection from the papers presented at the annual meeting held in Halifax 1981". The meeting referred to is that of the Canadian Historical Society. Contents are: 1 - "Splendeurs et miseres de Clio" by Pierre Savard, 2 - "All Sorts and Any Quantity of Outlandish Recreations: History, Sociology , and the Study of Leisure in Engalnd, 1820 to 1870" by Chris Waters, 3 - "Unwed Motherhood in Nineteenth-Century English Canada" by W. Peter Ward, 4 - "Paupers and Poor Relief in Upper Canada" by Rainer Baehre, 5 - "Work and Social Stability in Pre-Revolutionary Massachusetts" by Eric G. Nellis, 6 - "Cotton Imperialism: Manchester Merchants and Cotton Cultivation in West Africa in the Mid-Nineteenth Century" by Barrie M. Ratcliffe, 7 - "Governor versus Colonial Office: An Anatomy of the Richards Constitution for Nigeria, 1939 to 1945" by J. E. Flint, 8 - "Les carateristiques du syndicalisme minier francais et son apport au mouvement ouvrier francais" by Rolande Trempe, 9 - "Skill, Independence, and Trade Unionism in the Coalfields of Nineteenth- Century Britain, with Particular Reference to Scotland" by Alan Campbell, 10 - "Canada's Postwar Re-armament: Another Look at American Theories of the Military-Industrial Complex" by Lawrence R. Aronsen, 11 - "Fur-Trade labour and Lower Canadian Agrarian Structures" by Allan Greer. Very minor wear and soiling to the covers. .
Ottawa, Ontario. 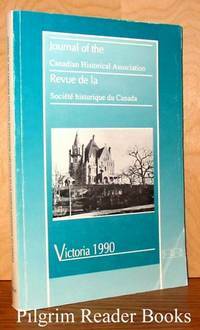 : Canadian Historical Association. Very Good. 1979. Soft Cover. 8vo - 23 x 15 cm. ; 217 pp. 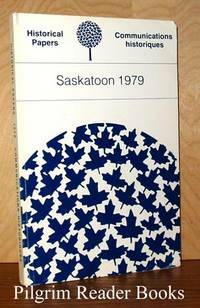 "A selection from the papers presented at the annual meeting held in Saskatoon 1979". The meeting referred to is that of the Canadian Historical Society. Contents are: 1 - "History and Nationality in Canada: Variations on an Old Theme" by Desmond Morton, 2 - "Thunder Gusts: Popular Disturbances in Early French Canada" by Terence Crowley, 3 - "Homeland to Hinterland: Political Transition in Manitoba, 1870 to 1879" by Gerald Friesen, 4 - "Canadian Families in Cultural Context: Hypotheses from the Mid-Nineteenth Century" by Chad M. Gaffield, 5 - "The Family Economy and Work in an Industrializing City: Montreal in the 1870's" by Bettina Bradbury, 6 - "Feudal Constraint and Free Consent in the Making of Marriages in Medieval England: Widow's in the King's Gift" by Sue Sheridan Walker, 7 - "Haugwitz, Kaunitz, and the Structure of Government in Austria under Maria Theresia, 1745 to 1761" by Franz A. J. Szabo, 8 - "A Mighty Impartial Personage: Disraeli's Entry into the Tory Party" by William A. Hayes, 9 - "Oppositions and Coalitions: James Gardiner and Saskatchewan Provincial Politics, 1929 to 1934" by Norman Ward, 10 - "An Authorative Voice: The Reorientation of the Canadian Farmer's Movement, 1935 to 1945" by Ian MacPherson, 11 - "Europeans and Amerindians: Some Comparative Aspects of Early Contact" by Olive Patricia Dickason. Very minor wear and soiling to the covers. .
Ottawa, Ontario. : Canadian Historical Association. Very Good. 1993. Soft Cover. 8vo - 23 x 15 cm. ; 317 pp. Contents are: 1 - "Presidential Address/Discours du President Whatever Happened to the British Empire" by Phillip Buckner. 2 - "The Reconstruction of Rural Society in the Aftermath of the Mayan Rebellion of 1847" by Barbara A. Angel. 3 - "Fair Wind: Medicine and Consolation on the Berens River" by Jennifer S.H. Brown and Maureen Matthews. 4 - "Science and Sentiment: Social Service and Gender at the University of Toronto, 1888-1910" by Sara Z. Burke. 5 - "Artisans in a Merchant Town: St. John's, Newfoundland, 1775-1816" by Sean Cadigan. 6 - "Paradise Postponed: A Re-examination of the Green Book Proposals of 1945" by Alvin Finkel. 7 - "I, Elena de la Cruz: Heresy and Gender in Mexico City, 1568" by Jacqueline Holler. 8 - "Rurality, Ethnicity, and Gender Patterns of Cultural Continuity during the Great Disjuncture in the R.M. of Hanover, 1945-1961" by Royden Loewen. 9 - "Un Espace de Vie: Les Charniers du Cimitiere des SS. Innocents a Paris, sous l'Ancien Regime" by C. Metayer. 10 - "Ontario Retailers in the Early Twentieth Century: Dismantling the Social Bridge" by David Monod. 11 - "Women Policing Women: A Patrol Woman in Montreal in the 1910s" by Tamara Myers. 12 - "Pigott's Private Eye: Radicalism and Sexual Scandal in Eighteenth-Century England" by Nicholas Rogers. 13 - "L'arme Favorite de l'Epicier Independent : Elements d'une Histoire Soicale du Credit (Montreal, 1920-1940) by Sylvie Taschereau. 14 - "Italian Immigrants and Working-Class Movements in the United States: A Personal Reflection on Class and Ethnicity" by Rudolph J. Vecoli. .
Ottawa, Ontario. : Canadian Historical Association. Very Good. 1990. Soft Cover. 8vo - 23 x 15 cm. ; 334 pp. Contents are: 1 - "Discours du president/Preside ntial Address Historiens, Archives et Archivistes: un melange a trois" by Jean-Claude Robert. 2 - "Contextualising Late-Nineteenth-Century Feminism: Problems and Comparisons" by Judith Allen. 3 - "Traveling the Country Round: Migrations et Syndicalisme chez les Mouleurs de l'Ontario et du Quebec, Membres de l'Iron Molders Union of North America, 1860 a 1892" by Peter Bischoff. 4 - "Il en faut un peu: Farm Women and Feminism in Quebec and France Since 1945" by Naomi Black and Gail Cuthbert Brandt. 5 - "The Making of a Nineteenth-Century Profession: Shipmasters and the British Shipping Industry" by Valerie Burton. 6 - "Associationism Canadian Style: Flour Millers, Self-Regulation, and the State, 1920-1935" by Mark Cox. 7 - "The Limits of Nationalist Politics: Electoral Culture and Mobilization in Germany, 1890-1903" by Brett Fairbairn. 8 - "Working-Class Standards of Living in Late-Victoria n Urban Ontario: A Review of the Miscellaneous Evidence on the Quality of Material Life" by David Gagan and Rosemary Gagan. 9 - "Ethnic Farmers and the Outside World: Mennonites in Manitoba and Nebraska, 1874-1900" by Royden Loewen. 10 - "Creating a New Staple: Capital, Technology, and Monopoly in British Columbia's Resource Sector, 1901-1925" by Jeremy Mouat. 11 - "Preparing the Welfare State: American Unemployment Reform in the Early-Twentieth Century" by Udo Sautter. 12 - "The Sin of Laura: The Meaning of Culture in the Education of Nineteenth-Century Women" by Marjorie R. Theobald. 13 - "Un site Exceptionnel d'Archeologie Industrielle en Belgique: Les Etablissements et la Cite Ourviere de Grand-Hornu, 1820-1835" by Hubert Watelet. 14 - "Selling Beaver Skins in North America and Europe, 1720-1760: The Uses of Fur-Trade Imperialism" by Thomas Wien. Corner crease on front cover. .
Ottawa, Ontario. : Canadian Historical Association. Very Good. 1978. Soft Cover. 8vo - 23 x 15 cm. ; 257 pp. "A selection from the papers presented at the annual meeting held in London 1978". The meeting referred to is that of the Canadian Historical Society. Contents are: 1 - "The View of History in the Making of Canada's External Policies" by David M. L. Farr, 2 - "Moat Theories and the English Atlantic, 1675-1740" by I. K. Steele, 3 - "The Wheat Staple and Upper Canadian Development" by Douglas McCalla, 4 - "Professional vs Proprietor: Power Distribution in the Railroad World of Upper Canada/Ontario, 1850-1881" by Peter Baskerville, 5 - "The Shaping of Canadian Criminal Law, 1892-1902" by R. C. MacLeod, 6 - "Canadian High Schools in the 1920's and 1930's: The Social Challenge to the Academic Tradition" by Robert M. Stamp, 7 - "Continuity and Change in Italian Education, 1859 - 1923" by Elmiro Argento, 8 - "Jill Canuck: CWAC of All Trades, But No Pistol Packing Momma" by Ruth Roach Pierson, 9 - "Business as Usual: Canadian Relations with China in the 1940's" by Kim Richard Nossal, 10 - "Resource Management Conflict in the Temagami Forest, 1898 - 1914" by Bruce W. Hodgins and Jamie Benidickson, 11 - "Ecclesiastica l Territorial Organization and Institutional Conflict in Eastern and Northern Ontario, 1840 - 1910" by D. G. Cartwright, 12 - "The Vichy-Free French Propaganda War in Quebec, 1940 - 1942" by Paul M. Couture, 13 - "Academics and Social Scientists versus the Press: The Policies of the Bureau of Public Information and the Wartime Information Board, 1939 - 1945" by William R. Young. Minor wear and soiling to the covers with a chip on the lower spine. .
Ottawa, Ontario. : Canadian Historical Association. Very Good. 1968. Soft Cover. 8vo - 25 x 16.5 cm. ; 247 pp. 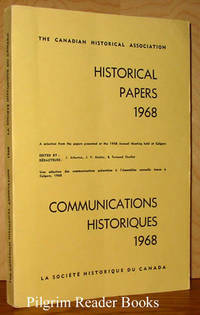 "A selection from the papers presented at the annual meeting held at Calgary 1968". The meeting referred to is that of the Canadian Historical Society. Contents are: 1 - "Somewhat Narrow Horizons (presidential address) " by J. M. S. Careless, 2 - "Some Aspects of the Business Career of Charles Aubert de la Chesnaye, 1632-1702" by Y. F. Zoltvany, 3 - "L'Echec de la Construction Navale Royale a la fin du Regime Francais" by Jacques Mathieu, 4 - "The Making of a Province: Nova Scotia and Confederation" by K. G. Pryke, 5 - "La Succession de Cartier, 1873-1891" by Andree Desilets, 6 - "Pilgrimages to Ottawa: Canadian-American Diplomacy" by Alvin C. Gluek Jr. , 7 - "James Bryce and the Establishment of the Department of External Affairs" by F. A. Coghlan, 8 - "Laurier, Aylesworth, and the Decline of the Liberal Party in Ontario" by P. D. Stevens, 9 - "Nationalism in Canada's First Century" by Margaret E. Prang, 10 - "Procopius of Caesarea and the Emperor Justinian" by J. A. S. Evans, 11 - "A Household Book of Queen Isabella of England, 1311-1312" by F. D. Blackley and G. Hermansen, 12 - "Newman - Historian or Apologist?" by H. A. MacDougall, 13 - "India and British Party Politics in the 1870's: Conflicting Attitudes of Empire" by E. C. Moulton, 14 - "Bi-Cultura l Societies and the Historian: Nationalism and History in India and Pakistan" by F. Lehmann, 15 - "The Austro-Hungarian Ausgleich of 1867: Some Historians' Views" by R. E. Wynne, 16 - "The Meeting Between Pope Pius XII and Ribbentrop" by J. S. Conway. Minor wear and soiling to the covers. .